Google Trends is a free web service offered by Google that shows how often a specific keyword (or a combination of keywords) is searched, compared to the total search volume across countries, and in various languages. Having said that, you can use Google Trends for many many tasks, from general market research to more specific web marketing tasks such as SEO (positioning your website on search engines) or advertising campaigns. You decide it! In this post I am going to provide a couple of examples of how Google Trends can help us for a preliminary market research. Let say we are a travel agency and we want to promote our new tours to Latin Ameirican consumers, Mexican ones in particular. As shown in the following chart, I’ve first compared the 4 keywords, without any country filter. Google Trends shows “boletos avion” (red colour) as the most popular search at a world level. The timeframe used was last 2 years (Jan 2012 to Jan 2014). “tickets avion” does not present search volume in Latin America. Bottom line: SEGMENTATION is key! In this case it was geographic, but it could be other. So, let say we were interested in Mexican market, the combination of keywords “boletos avion” seems to be the way to go. Thanks Google Trends! A great feature provided by Google trends is comparing keywords searches with external factors. Let’s keep using our travel agency example: say this time we want to see volume searches for the brand keyword “Iberia”. Beside the chart line, Google Trends reports the main news headlines associated with the keyword we are analysing. 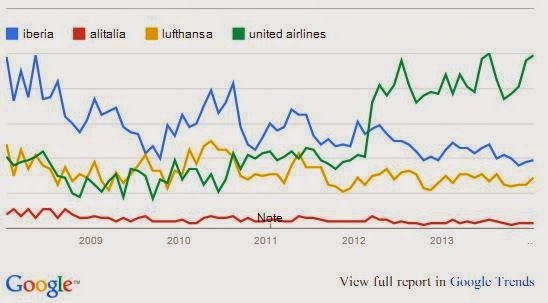 We see in the chart that peaks on searches, particularly in April 2012 and February 2013, were associated with news reporting of a major strike of the airline company (I was actually traveling myself in Feb 2013...). As many businesses, traveling and tourism do present some seasonality. For marketers this means identifying patterns in customers demand, so that they can be more responsive and deliver better products/services. In order to show seasonality here, I’ve analysed the keywords “paquete vacaciones” (in english “holiday package”) for a longer period, last 6 years of searches in Mexico. The resulting chart shows a pattern. Our keywords present peaks in searches on July of every year (though the pattern looks weaker over the last three years). Bottom line: take a fairly long period and look for consumer patterns. In our case, we can recommend launching a marketing campaign at least a few months before July. Finally, we can obviously use Google Trends to perform some nice competitive analysis. What I’ve done below, is comparing the keyword “Iberia” with other major airline brands in the market. We can see that Iberia used to be the leading brand in the market in terms of searches. However its market shares are getting smaller as consumers search more and more for “United Airlines”. The aim of this post was to show how simlpe is performing an online market research through Google Trends with a few examples, I hope I covered most of the features vailable. Can you suggest other ways we could use Google Trends for gathering marketing insights? Any other feature vailable that I haven´t mentioned here? Feel free to comment and share your thoughts/critique/guidance here.